Sea salt and tiramisu swirl topped with caramelised popcorn and toasted marshmallow. Aqua S Soft Serve is a little hidden gem on George Street in Sydney's CBD. Tucked away on the ground floor of Regent Place, it is easy to walk right by and not notice a thing. This experimental ice-cream place is quite popular, so to avoid long queues, it is best to get in on a week day, if you can. The flavours are always changing at Aqua S, which just adds to the excitement and intrigue. This particular soft serve is sea salt and tiramisu flavoured. While the blue sea salt flavour is a permanent fixture on the menu at Aqua S, the tiramisu flavour is one of two flavours that change every fortnight (the other flavour at the moment is tomato). While the sea salt was light and refreshing, the tiramisu however, was rather ordinary and much like a standard chocolate ice-cream. The cone, which is optional, lacks a distinct flavour, yet is a unique black colour. Alternatively, you can choose to have your soft serve in a cup rather than a cone if you'd prefer. Toppings are what really make this place unique, and where all the hype stems from. 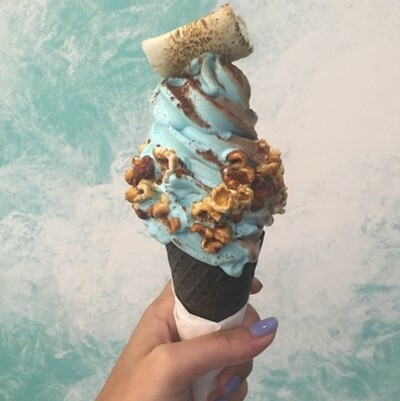 Caramelised popcorn, a cloud of fairy floss, popping candy and toasted marshmallows are all topping varieties which you can get to customise and enhance your delicious soft serve. The soft serve in itself is creamy, cool and refreshing. It is also much lighter and creamier than an ordinary gelato or ice-cream and is just as satisfying and infinitely more aesthetically pleasing. This place is a must try for ice-cream lovers. Where: Shop 27 Regent Place, 501 George Street, Sydney, 2000. When: 12pm - 10pm daily. Great photography - looks amazing. Thanks to your review I will definitely be heading down there when I get a chance!